Network Know-How (book review): Learn how to network!! My husband grabbed this book as soon as it arrived in the mail for review. He took it to work with him and read it any chance he got. My husband is not a book reader, so I was surprised that he read it...over and over. We want to network our home computers, and he said this book was such a helpful guide. He said there was so much he didn't know, and often times he would come home telling me bits and information he found in the Network Know-How book from No Starch Press. With the Network Know-How book you will be able to design, map, and maintain a trouble-free network: explaining how to run cables, set up Wi-Fi access points, configure file sharing and printing, and implement security. Network Know-How book is going to be our guide when we set up our networking between our computers, televisions, and gaming equipment. I am glad to have this helpful guide available to us, because there is so much to know! Network Know-How covers both wired and wireless networks and even includes advanced topics like DHCP, creating simple intranets, and stringing Ethernet cables. With his reading of this book, my husband now wants us to have wireless, and set it all up himself. We found this book to be so helpful, and I think anyone who reads it and uses the information to set up their own networking, will get the help they need. I think many like the idea of doing things themselves, and the Network Know-How book provides the opportunity to do just that. You can order your copy for $29.95 from Oreilly.com. I love the Aroma Rice Cooker that I got to review! I made great tasting brown rice yesterday! I couldn't believe how easy it was to use this rice cooker! I rinsed out the brown rice, then drained it. I poured it into the bottom of the inner pot and added the correct amount of water. I used the special spoon that came with the rice cooker, and leveled the rice out. I then shut the lid, it latched, and I pushed the brown rice button. No hassle, no sticky mess, and delicious rice! My kids loved the rice and I was very impressed at how easy, convenient and worry-free Aroma made my rice making! I love that the Aroma Rice maker, model ARC-998 8-cup, has a brown rice, white rice, steam, and warm/off button. Not everyone likes white rice, so it is nice to have the two different rice settings. I also made steamed broccoli in my Aroma Rice Cooker! The broccoli came out perfect, and it only took 5 minutes! I really like that the rice cooker is multi-functional! I am really looking forward to trying some of the recipes found on the Aroma Housewares website! 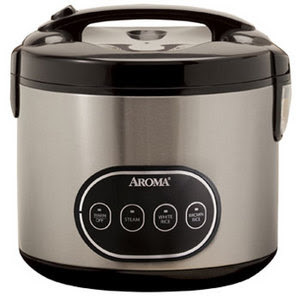 I know that the fall/winter season is coming up quickly, and it will be great making stews and soups in the rice cooker from Aroma Housewares! You can get more information and check out all the other Aroma products on their website. In the everyday stretch and squeeze of motherhood, Tricia Goyer often feels smooshed by the demands of life. In Blue Like Play Dough, she shares her unlikely journey from rebellious, pregnant teen to busy wife and mom with big dreams of her own. As her story unfolds, Tricia realizes that God has more in store for her than she has ever imagined possible. Sure, life is messy and beset by doubts. But God keeps showing up in the most unlikely places–in a bowl of carrot soup, the umpteenth reading of Goodnight Moon, a woe-is me teen drama, or play dough in the hands of a child. In Tricia’s transparent account, you’ll find understanding, laughter, and strength for your own story. And in the daily push and pull, you’ll learn to recognizes the loving hands of God at work in your life… and know He has something beautiful in mind. Tricia Goyer is the author of numerous works of fiction and nonfiction, including Generation NeXt Parenting and the Gold Medallion finalist Life Interrupted. Goyer writes for publications such as Today’s Christian Woman and Focus on the Family, speaks to women’s groups nationwide and has been a presenter at the Mothers of Preschoolers (MOPS) national convention. She and her husband, John, live with their family in Montana. You can purchase this book online: click here. Want to win a copy of Tricia Goyer's Book: Blue Like Play Dough? This contest is open to those in the United States, non-bloggers, and bloggers. Comment here about how motherhood has shaped you, or what things you endure as a mom. Contest will end on August 11th, 2009. For extra chances you can: blog this contest, add my button to your site, subscribe to my blog, twitter and/or facebook this contest, and/or visit everyday and add another friendly comment. Lots of chances to win! Don't forget to put the extra comments for the "extra" work. Good luck! Growing up, Operation and Connect 4 were on my "favorites" list for games to play. 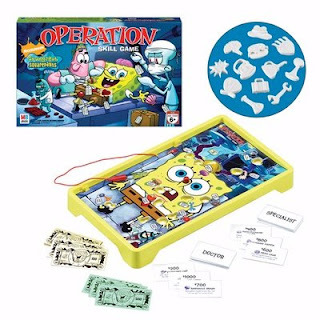 Well, Hasbro just came out with a fun line of the traditional Connect 4, Sorry!, Operation, Memory and Cranium games only they are SpongeBob Square Pants styles. We got the Operation game and the Connect 4 game to review from Hasbro. I thought both games were easy to assemble. The Operation game had little white "parts" that easily snapped out of the plastic sheet. Then, I just added some batteries to get the buzzing sound when I operated on SpongeBob. I thought the new parts were comical (Barnacle brain, Clammy hands). My younger kids, Caleb (age 4) and Madelyn (2) weren't all that impressed with the buzzing, but they did enjoy watching me operate on Bob. Connect 4: SpongeBob Squarepants edition was very easy to assemble. There were pink checkers and yellow checkers. I had a few sheets of Pink Patrick stickers, and Yellow SpongeBob stickers. My kids enjoyed separating the pink and yellow checkers. This Connect 4 game is just like the original, however you get a new twist...your opponent can put SpongeBob in his place. The opponent has the opportunity to block holes or columns by placing the SpongeBob face on the board. It was fun playing Connect Four with a new twist. YOU HAVE THE CHANCE TO WIN ONE OF THESE GAMES FROM HASBRO! This contest is open to those in the United States, non-bloggers, and bloggers. Go to the Hasbro website, and take a look around. Find out what sparks your interest and comment here about to enter for this contest. There will be two winners! One will win the Connect 4 and one will win the Operation game. Please specify which one you would like to win! Contest will end on August 11th, 2009. For extra chances you can: blog this contest, add my button to your site, subscribe to my blog, twitter and/or facebook this contest, and/or visit everyday and add another friendly comment. Lots of chances to win! Don't forget to put the extra comments for the "extra" work. Good luck! I love Cinnamon rolls, even though they aren't that good for watching my calorie intake. Mom Central offered the opportunity to review the new Kellogg's Cinnabon bars and I was right on board. I was so thankful that I was able to try these delicious snacks~ and so were my kids! We got a whole box (6 bars) in the mail. We couldn't wait to try them out. We took one out of the wrapper, put it on a plate, and heated in the microwave for about 10 seconds. (we have an older microwave so it takes a little longer). The smell was wonderful! The taste was delicious and was very similar to cinnabon rolls. The cookie outside was filled with brown sugar and cinnamon, and it was glazed with a cream cheese frosting. MMMmmmm~ good, and only 150 calories per bar. I like that these bars taste good heated up, and just right out of the package. I preferred to heat them up, though. I love the warm taste of the Cinnabon! 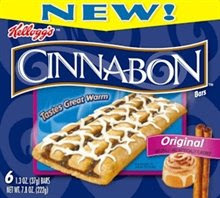 I am sure that we will have to get Kellogg's™ Cinnabon™ Snack Bars in a upcoming trip to the grocery store. Thank you, Mom Central for sending our family a box to try. 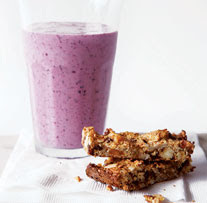 We give this yummy new snack a double thumbs up! and let them sit on plastic, and covered with plastic for 24 hours. After 24 hours, I cut the rubber bands, rinsed out the shirts, and washed/dried them. See~~ now, it is a happy face that created happy faces on my kids, too! My kids love their new shirts, and I love to have the three of them wear them together. I should have made a onesie for Cole, too. This is a super product to do this project with your kids! What a great home school experiment, too. You can teach about mixing colors to create new colors, art....and science. I think this would make a great gift for a birthday, too. You could get a kit and do the project with your kids, and they can give the finished project to a friend or family member for a gift. Nothing like a homemade gift! I highly recommend Jacquard products to you! The Funky Groovy Tie Dye kit is only $11.95, and geared toward ages 5 and up. I didn't have Caleb (age 4) or Madelyn (age 2) use the dyes, but they did help get their shirt wet, hand me rubber bands, and get the enjoyment of wearing their shirt. Nathaniel had a great time doing the whole shirt by himself. I think he did a fantastic job, too! Thank you Jacquard Products for the opportunity to review your Tie Dye kit! We love it, and are happy to let others know about them! About the company: Jacquard Products has been producing professional-quality textile paint and dyes at the best value for surface designers, textile artists, fine artists, hobbyists, and crafters. It has almost 20 color lines, available in standard and bulk sizes, sets, and in easy-to-use kits. Offering the highest quality of dyes and inks that hold fast and color deeply, do-it-yourself people can bring professional creativity to their home, school, patio or anywhere they wish to create wearable art. Want a chance to win a Tie Dye kit and enjoy this fun project kit to use with your family and/or friends? This contest is open to those in the United States, non-bloggers, and bloggers. Go to the Jacquard website, and take a look around. Find out something interesting and comment here about to enter for this contest. 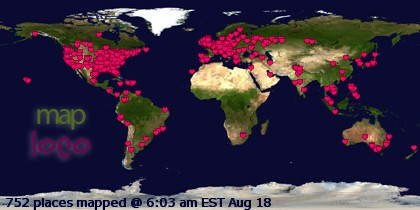 Contest will end on August 4th, 2009. I have always loved milk, and the many forms of milk: milk in the glass, milk in cheese, milk in shakes, milk in smoothies, milk in ice cream...MMMM....milk! It really does a body good! Milk is loaded with good nutrition, vitamins, and great for bones! I have recently been introduced to a great milk website called whymilk.com. Whymilk.com has so many great suggestions for ways to incorporate milk into your daily intake. Personally, I don't mind drinking the recommended 3-4 glasses a day; however, I know there are many ways that everyone can get the dairy our body needs~ even if you don't like milk by itself. I have made several smoothies for my family, and my kids (and husband) love drinking them. Not only are they getting a serving or two of milk, they are getting fruits, too. I use ice cubes, milk, frozen (thawed) fruit, banana, vanilla yogurt and some sweetener. Unfortunately I have recently laid our blender to rest, so once my new one comes, I can try the delicious recipes found on whymilk.com! I found a few recipes of different smoothies on the Whymilk website, like the Blueberry Blast, Mom's Mocha Indulgent, and the Peanut Butter Split Smoothie. I do have to say that the Avocado Mango smoothie sparks my interest...I wonder how that tastes? Whymilk.com offers a great selection of meal ideas for breakfast, snack, lunch and dinner. I would like to try the different soup recipes. The Tomato Basil sounds really good! I think my husband would like to try the At-home Cappuccino recipe. There are so many recipes that make a recipe great, and you are getting what your body needs when you consume them! I am so glad that Mom Central introduced me to Whymilk.com. It will be fun to introduce new recipes to my family with this great website. I usually don't have too much difficulty having my kids drink milk, smoothies, or eat any other dairy product. Whymilk.com has great tips and tools to help figure out how you can get your servings of milk in different forms, check your BMI and how many calories you burn, how your beverage choices impact you, how to recover from workouts with milk and more! I found the website to be very helpful and filled with great information. Whymilk.com also offers fun contests, so checking out the site can be even more beneficial when finding great recipes to use milk in. I know this is a site I will be adding to my favorites! Thank you Whymilk.com and Mom Central for letting me learn more about milk, the benefits, and for sharing this with my readers! Natural Dentist Products (and a giveaway)!! I am so happy that I keep getting introduced to new products that are more natural, good and real ingredients, that are not harmful for us to use. I think companies are realizing it really does matter what we put into our bodies. I love learning more about the better products. The Natural Dentist asked me to review some products from their line, and I was more than happy to review them. They have oral products: toothpaste and mouth wash, in different flavors. I was sent the Special Gel Formula for Kids, Healthy Teeth & Gums original (peppermint twist) toothpaste and the Healthy Gums mouth rinse in Orange Zest. I think that my teeth are just as clean with the Natural Dentist products, but are taken care of with healthier products. The peppermint twist toothpaste tastes fine, and isn't as "potent" as other toothpastes that I have used over the years. My kids weren't very interested in the taste of the Special Gel Formula (berry blast) toothpaste, but I think that is because they are used to what I have bought them in the past. I feel better about my children using the Natural Dentist products over other name brand products that may contain harmful ingredients. No Sodium Lauryl Sulfate or artificial ingredients (SLS is a foaming detergent that can irritate your mouth and has been linked to canker sores) That is interesting to hear about! I haven't hear that before...good information! I think that The Natural Dentist products are great products, and I would recommend them to you! They are offering to sponsor a giveaway for my readers, so you can try them out, too!! This contest is open to those in the United States, and one winner will get to chose a toothpaste and mouthwash they would want. To enter, go to The Natural Dentist website, and pick out the two items you would like to win. This contest is open until July 28th. "I don't believe I have ever seen a shoe mailed to someone before." At first I thought he was joking, and I really didn't comprehend what he was saying. I thought maybe he had something wrong, or picked up this flip-flop near our mailbox on the ground. I have been introduced to something so yummy, and I can honestly say that this has become a new favorite snack. Being a member of MyBlogSpark, I get asked to review some products. This time I was asked to try out the new Nature Valley's Nut Clusters and I think they are great! The Nut Clusters are fun to eat, taste great, and is a healthier option for snacking. I was sent 4 bags, one of each flavor, of Nature Valley Nut Clusters to review. I am not sure which one I would label as my favorite, because they all are great to snack on. I found them to be filling, too. I did share them with my husband and my kids, even though I could have indulged in them all on my own. :) My husband and kids loved them, too. I think my top two favorites would be the Honey Roasted Peanuts, and the Roasted Cashews. The other two flavors are the Nut Lovers and the Roasted Almond. The Nut Clusters are exactly what the name reveals: Nut Clusters, of good taste. The nuts are bunched together in a ball with some granola, krispie treats, and more. I like that you can read, and understand, the ingredients in each of the 4 bags of Nut Clusters. This makes me more confident about being sure what I put into my mouth. I haven't seen this delicious, and nutritious snack on the store shelves yet, but I am on the look out. Thanks to MyBlogSpark and Nature Valley for sponsoring this review, and letting me try these out! Our family appreciates it! Have a birthday party that you are planning for your son or daughter? 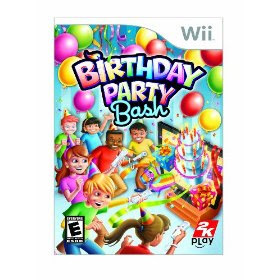 I just had the opportunity to review a fun new game for the Wii, in which you can design a "party" for your children to celebrate with friends. Birthday Party Bash, from 2k PLay, can be played by up to 12 people. This game is a lot of fun, and easy enough for younger children (like ages 4-5), but can also be challenging enough for an adult (like me). Including over 20 games, this game offers some easier games like Pinata Blast, to more challenging games like the Laser Gremlin. My son, who is 10, and I tried this game out. We made a custom party with a Princess Theme. Since my Birthday is next week, we decided to plan the party for me. I invited, and included my son on the invitation on the Wii game. I picked the characters for us, to represent us. I got to enter our names, and my birthday age. Throughout the game, we played the mini games for our party. Some of our favorite games were: Duncan Hines Cake Stacker, Slingshot Splash, Balloon Popper, and the Scribble. We thought that the Bug Catcher and the Laser Gremlins were the most challenging. It can be a challenge to hit the targets just right. After every mini game we played, we got more favors for our party. We got fancy chairs, balloons, hats, plates, cake, a Princess Throne, and more. It was fun seeing the party come together. I can see how this will be fun to design a party for my younger kids. One great feature of the game, I thought, was that if a player is out of the game...they can still shake their Wii remote and their character will do a funny thing. There are several themes to choose from when planning the party: Music, Sports, Army Men, Construction, Pirate, Glamour, Magical Forest, Monsters, Stuffed Animals, and the Princess theme. It was fun customizing ourselves, and the party guests. We had the choices of body size (short or tall) boy or girl, and choices between the boys and girls for faces/hair colors. I like that there is several options for how you design your play. You can even pick a grandma or grandpa for them to play along with the grand kids. That is funny! Included in the game is party invitations (post cards) with the design of the Birthday Party Bash game on it. Also, there was a coupon for Duncan Hines~ buy one get one free~ to make your birthday party taste delicious, too. The instructions for the game has ideas on how to make your party a success with your planning. It is a great help. My son said this game is a bit too young for his age group (10 years), but I think it all depends on your child. This game is geared toward everyone between age 4 and 20. Birthday Party Bash just hit the shelves on Monday, July 13th. I think the value is great at $39.99 for the game. Thank you Mom Central for this great review opportunity, and for introducing me to it. I love helping spread the word! HIT Entertainment and Lionsgate released a few great DVD's today! The prices are right, and kids love them! Bob the Builder and the Can-Do Crew come together in five episodes (Radio Bob, Super Slasher, Roley Brings the House, Silent Scoop, and Scrambler gets Prepared) as they build a radio station complete with a sky-high broadcast tower, play skidsies with Roley and Muck, design greenhouses out of recycled material and much more. Alongside Bob, Scoop, Benny and the rest of the team, kids see that they can accomplish anything with a Can-Do attitude. 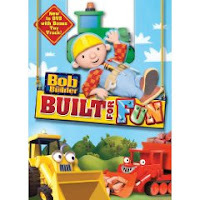 This special DVD includes a "Build with Bob" game, and a read-along called "Building Buddies." My kids love Bob the Builder, and he always has a good, and positive attitude toward teamwork, and helping others. Jammed packed with all new school episodes, to get our kids excited about learning, come the fun-loving preschool entertainers: Thomas, Barney, Fifi and the Flowertots, Bob the Builder, Fireman Sam and Kipper. We have enjoyed watching the episodes and listening to the lessons on sharing, friendship, cooperation, and learning. With six different episodes, these characters bring lots of fun for preschoolers everywhere. · Bob the Builder - "Dizzy and the Walking Bus"
· Kipper - "Hide and Seek"
from the creators of Bob the Builder. My kids always look forward to seeing Roary and just love seeing what kind of mischief he is going to get into. It's time for a book fair! Barney, Baby Bop, BJ and the kids are headed to the park for a book fair. Every time the kids open a book, they are dazzled with a new tale. I like how they use their imaginations with rocket building, and hosting a circus. Barney episodes always have lots of dancing, singing, music and great lessons to learn. The DVD is a full-length, and it comes with a Counting to 10 storybook (hardcover). I think this set is great for the price, because you get a full-length DVD show, plus a story book to share with your children...all for only $14.95. Barney is a fun-loving character, and always shows kids how to be more caring, loving, and to share with others. The book (Counting to 10) is very colorful, and it is fun to count to 10 with my kids. They love counting books, and it is fun counting with Barney. 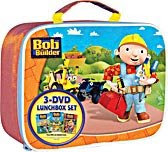 There are 4 fun lunch box gift sets available from HIT Entertainment and Lionsgate: Bob The Builder, Barney, Thomas & Friends and Care Bears. These sets are so fun~ I love them! I got a Bob the Builder set to review, and my son loves it! The DVD's have fun stories, and my son loves using his lunch box to hold his treasures in it. The lunch boxes are insulated, and have a handle for easy carrying. I think this set is very well priced! You get a great bag/lunch box, plus 3 movies. Adventure Bus - Hop aboard and get ready for the ride of your life as bus driver Barney takes you to some of the gang’s favorite imaginary destinations, including a castle, a pizzeria, a circus and the Old West! Imagination Island - A storybook adventure comes to life when Tosha and Min discover that their wish to sail to a magical island is possible with help from Barney and his friends. Everyone is Special - Join Barney and his friends for a dino-mite day in the park as they celebrate all the things that make them – and you – special! Tales from the Tracks - Ride the rails to adventure as Thomas and his engine friends attend a birthday picnic, discover a ghost engine and learn the legend of a very special lamp. Best of Percy - Learn more about the junior member of the railway, a faithful friend of Thomas’ from the very beginning, and celebrate all of the special traits and qualities that make Percy a fan favorite. Races, Rescues & Runaways - You’ll find that life on the Island of Sodor is never boring, especially when the engines get into trouble. But no worries … as friends they’re always there to lend a helping hand for each other. The Big Game - Bob and his machine team are ready to play! Prepping for the big soccer match, a line-marking machine suddenly runs amok. Can the Can-Do Crew fix it in time for the opening whistle? Yes, they can! Then it’s off to the tennis courts to serve up more fun! Celebrate With Bob - Looks like Bob is in for a busy, busy day! There’s a dance contest, a surprise birthday party, a really messy office and a broken computer, but it’s all in a day’s work for our favorite Can-Do builder. Can We Fix It? - It’s harvest time and there’s plenty to do: Farmer Pickle’s barn is about to collapse and needs repair before the impending rainstorm, Travis gets stuck in the mud, a golf course needs constructing and Bob builds himself right into a windmill! Journey to Joke-a-Lot - Follow Funshine Bear, who, frustrated by too many jokes gone wrong, travels to faraway Joke-a-lot where the community of kooky, colorful characters quickly crowns him King. Missing their beloved prankster, his fellow Care Bears leave the comforts of Care-a-lot behind and embark on a quest to coax their friend to return home. The Gift of Caring - Join the Care Bears as they use fun, magic and the most extravagant gift of all - caring. In seven heartwarming episodes, the Care Bears tumble through birthday parties, reunite with long-lost friends and even search for a valley of gold! They're wrapping up some fun they can't wait to share with you! Fitness Fun On Your Mark...Get Set...Go Have Fun! Join the lovable Care Bears in active adventures that teach everyone how to be a good sport - and everyone is a winner! In five fun-filled episodes, the Care Bears and their Cousins share lessons in friendship, fair play and fitness. The whole family will love getting into the game! Thomas & Friends™: Percy and the Bandstand, has 4 new episodes on it from the Island of Sodor. The newer Thomas & Friends DVD's have new animation. The host, Mr. Arkwright, returns with never before seen content that can ONLY be found on DVD! Mr. Arkwright is Sir Topham Hatt’s right-hand man and the new driver on the Island of Sodor. For more information: visit HIT Entertainment and/or or Lionsgate. It took Madelyn a bit to figure out how to pump the Critter Blaster, but now she is a pro! Caleb was her helper, and after a few times of him filling her critter, now she is doing it all by herself (and she is 2 years old). She loves sticking it down into the bucket of water, pulling up the turtle, and then squirting out the water in a blast! I was surprised at how far these mini squirters could shoot! Here she is looking for something to aim at..... She has pretty good aim, too. She loves to do what her brother does. Even if it means aiming at her parents! :) I didn't get a photo of that, but yes, she did get me good. Caleb absolutely loves to shoot his Dolphin water toy. He enjoys shooting it straight up in the air, which the water ends up hitting me or Terry. That is funny, of coarse. I love the look on his face here, priceless! The Blaster Board is a fun toy, as well. Kids can take this board out swimming and use as a kick board. Little do the other swimmers know that this kick board is also a weapon. What fun Nathaniel has at shooting his friends in the water and they are unaware. Caleb is filling up the Blaster board here, and getting ready to (try) and shoot at some sea gulls. Thank you Prime Time Toys for adding more water fun to our summer! We love the toys! Would you like to enter to win a water toy from Prime Time Toys? You are in luck! They are sponsoring a giveaway for my readers! The winner will get to chose between four toys: the original Max Liquidator, Critter Blaster, Monster Blaster or the Blaster Board. To get your entry, go to the Prime Time Toys site and find something about their company. You have until July 28th and this contest is open to bloggers and non-bloggers of the USA. Our family loves playing games, board games, card games, video games, outdoor games...you name it! 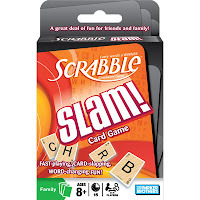 We were happy to review the newest Hasbro card games, Monopoly Deal, and Scrabble Slam! We love the original Monopoly game, and the Monopoly Deal is similar in many ways. You get 5 cards to start out the game, and you can lay your bank money down in front of you, and your properties that you are starting to acquire. I have realized it is a good thing to lay down money into your "bank" right away, because the other player can demand money from you, and you pay with whatever is laid down on the table. So, if you only have properties laid down, that is what you pay the opponent with. Each card has a cash value, and/or property/action to it. You can make others pay you money, by laying down the Debt Collector card, or "It's my birthday." The game can also take new twists, because you can be forced to change cards or properties with your opponents. Don't worry, though, you may have a card in your hand to tell them "NO!" Other great card games that Hasbro just came out with are: Crazy Old Fish War, Littlest Pet Shop Go Fish, and Rook. You can have a chance to win Monopoly Deal or Scrabble Slam! There will be six winners! Go to the Hasbro site, and take a look at all the cool games and toys they have!Leave a comment about which of the two games you would like to win. This contest is open to those in the United States and will end on July 23rd, 2009. For extra chances you can: blog this contest, add my button to your site, subscribe to my blog, twitter and/or facebook this contest, and/or visit everyday and add another friendly comment. Lots of chances to win! Don't forget to put the extra comments for the "extra" work. Good luck! I just got done reading The Captain's Bride, by Lisa Tawn Bergren. It was a superb book! It is book one of the Northern Lights series. Lisa really draws you into the character's lives, emotions, and experiences. The main character, Elsa, is from Bergen, Norway, and she is the Captain's wife. The story is about Elsa, her marriage, and their journey to the Americas. The Captain, Peder Ramstad, gather with their friends and travel across the seas. This book dives into the stories of a few different characters: Kaatje Jansen, Tora Ander's, and Karl Martensen. Kaatje is struggling to keep her marriage together, being pregnant, too. Tora is a stow-away on the ship, and Karl is torn between feelings of loyalty and friendship with Peder to having deep, love for his best friend's bride, Elsa. This is a great book, and I couldn't put it down. There are so many moments that you just have to find out what happens next. It is fun to read of the stories that come from the ship-life. I recommend this book to those that love history, love, romance, suspense, and drama. I am looking forward to reading the second novel. Maire by Linda Windsor, is book one in Fires of Gleannmara. The setting is Ireland, and the story is about Maire, who is the Warrior Queen of Gleannmara. Maire captures Rowan, who is a warrior from Emrys, reformed mercenary, and takes him as her husband. She has a challenging time understanding his unwavering faith, and his dedication to God. She cannot deny that the truth he displays: meekness and humility are stronger than any blade of steel. With that kind of weapon on their side, they battle together against the evil druid Morlach and corrupt his forces of darkness. In the end, they discover the cost, and joy, of following the one true God and His Christ. Much of the legend, phrases, facts and language is that of Ireland. The story is from the heart of Linda Windsor, and her children. There is even a glossary in the back to help you understand a bit about her, and her put into words. Mom Central Summer Giveaway Bonanza!! Giveaway Galore! • Hoover Cyclonic Bagless Upright Vacuum: This new vacuum from Hoover removes more dirt than other cyclonic bagless vacuums due to its patented wind tunnel technology and embedded dirt finder. With power controls on the handle, it reduces bending to get to those hard-to-reach places and easily moves from hard floor to carpet. • Crayola Play Sand: Transform an ordinary sandbox with a splash of color or design colorful art projects with a 20 lb. bag of Crayola Play Sand. The sand doesn't stain hands and features an easy-to-carry handle to make transporting easy on Moms. • Jeep Tandem Stroller: Built to accommodate your growing family, the Tandem Traveler Stroller features sun canopies, reclining seat backs, car-seat adaptors, and cup holders that will leave you feeling like the coolest mommy on the block. • Razor Jr. Electric Wagon: Put a modern spin on the classic wagon with the Razor Jr. Electric Wagon. Traveling safely at 2-3 miles per hour, parents have assistance while cruising the block. The MomCentral Summer Giveaway Bonanza started on Monday, July 6th and will run through Friday, July 17th. So, head on over to MomCentral to enter for your chance to win! My brother got married on June 13, 2009. It was a beautiful wedding, and the weather was PERFECT for a wedding. I loved being there to support my brother and partake in the celebration of their vows to each other. Caleb was asked to be the ring bearer. He was so excited to be in their wedding and to bear the rings. He was extra excited to go down the aisle with his cousins (Atira and Emma) who were the flower girls. Here is a picture of their rehearsal. The chaplain was the lady in the black pants and black/white top standing in front. I have never been to a wedding where the one officiating was a female. She did an excellent job with the marriage, and she had such great things to share with Russ and Melissa. She was a mentor of Melissa's from way back, and she is also a great friend of their family's. Melissa (my new sis-in-law) has been "in the picture" for a long time before my brother caught her. Melissa was a friend of my sister's back when my sister was in High School....so like, over 10 years ago. So, I have known Melissa a long time. It was fun to welcome her into our family permanently. Here is a few more pictures that I snapped at the rehearsal dinner. They had the dinner at Russell's house. I personally think it was too much on his plate to host the dinner at his house when he was getting married the next day. I could tell he was stressed, and I felt bad for him. Anyway, here is Caleb and Madelyn with some of their cousins. Here are "the boys" grilling the meat. Terry (far left), and two of my brothers in the middle and far right. Here is a picture of the Moms! My mom is on the right side. Here is a picture of the Dad's. My Dad is on the left side. Here is Emma and Atira (my nieces) throwing the petals for the Bride. Caleb wasn't able to join them due to his fears. He was a bit nervous to be showcased. My brother has such a great look on his face as he looks at her. He looked great up there, and it seemed as though he was just so giddy! I loved watching him. At least the pictures for the wedding memory book have Caleb in them. Even though he didn't get to walk down the aisle, he still got some great photos of himself in a tux! What a handsome guy! Here is Miss Madelyn. She loved her pretty pink dress that she wore. While the photos were going on, I did our nails (toe and fingers). She thought that was so fun, and loved to show people her nails. By the way, I am sad that I didn't get a family photo at all during the day. My parents look great! I love that they had such a fun day! They are currently in their 51st year of marriage! What an inspiration! Here is Caleb showing us his muscles. This is his big thing right now. He likes you to comment about how strong he is, and how he is growing. Here is a picture of 4 of my beautiful nieces. 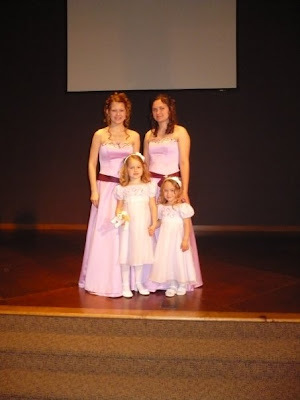 The two in lavender are my brother's daughters (the one that got married). It was fun to see them supporting their Dad and standing up for him and their new mom-in-law. Here is Nathaniel and my other niece, Adrianna. They had such a blast hanging out together. They are only a year apart in age. Madelyn loved the frosting on the cake. She was loving the taste. My cousin was cheering her on and getting some good laughs. It was a great day! The wedding ceremony was beautiful. It started off with a slide show of Russ and Melissa as children, teens, dating each other, and now onto marriage. There were pictures of Russell's daughters in there. I was crying even before the wedding. My mom's quartet sang for the ceremony, as well as my brother sang. They all did a wonderful job! My mom's quartet also sang for the reception. It is always fun to hear those gals sing! The reception was at a ski and tube place about 20 minutes from the church. The catered meal was delicious, and it was a fun reception....until Caleb got sick and our evening was cut short. Caleb must have had too much sweets and too much running around. He was very tired, too, because he slept the whole way home. He didn't have a "bug" though, because he was fine the next day. I am so happy for my brother and new sister. It was such a fun day! God bless their marriage! What is up with you? ?